I get a lot of questions about truck canopy camping thanks to this blog, my truck canopy camping tips email series, and the truck camping Facebook group. 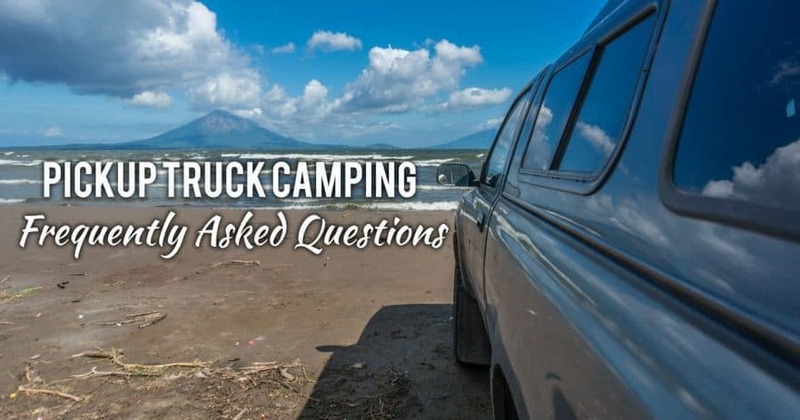 Rather than keep the responses private, I thought it would help all my fellow truck campers out there to republish these questions for the wider world. Do you have a truck canopy camping question? Shoot me an email at ryan@desktodirtbag.com and I’ll give you my take! These questions hit on a little bit of everything, so take a look, maybe it applies to you. Question: What kind of Truck do you drive? I see its a Toyota. I plan to buy a truck for truck canopy camping and don’t know which kind to buy. Answer: I have a 1991 4X4 Pickup (4cyl). It predates the Tacoma models, and is known as a Hilux in other parts. 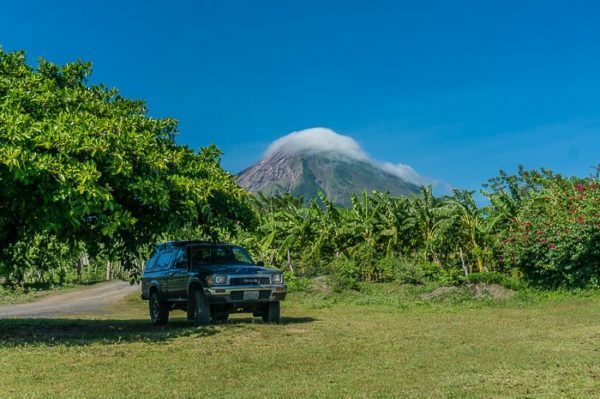 It’s a great little truck… Made it all the way through Central America with no problems. I’d recommend a truck with at least a six foot bed, ideal for me would have been an extended cab and air conditioning, but I can survive without it. I’m concerned about the extra weight and reduced ability to take 4×4 roads. I’ve had the tuck since it was new and 100% of the truck is stock except for the brakes and (larger) tires. Did you see reduced power/have any problems getting places with all this weight? Shocks? Struts? Other things I don’t even know about (I am not mechanically inclined) that I should consider on the actual truck before going through a mod of this level? I’m no mechanical expert. But with my simple build and limited gear, I didn’t feel the need to beef up anything with the truck itself. 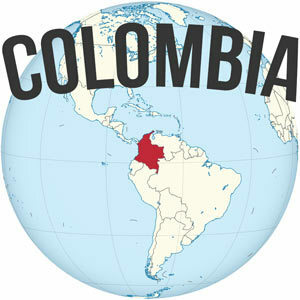 I’m going on 45k miles since building out the back of my truck, and have driven over some terrible roads in Central and South America. Nothing has broken related to shocks, struts, etc. And this is on an old 1991 truck, in some rough areas. I think you’ll be fine, but maybe chat with some gear heads to see if they warn you off. I was wondering what you would recommend for internet on the road. This last trip, I spent quite a bit of time trying to find free WiFi and would like something more consistent. Internet on the road, I just relied on Verizon. It had the best coverage in rural areas (at least when I did it a few years back). If your phone is unlocked, you can use it as a mobile hotspot. You can get a cheap decent open phone (I got the Samsung J7) from Amazon, which is how I share internet access with my laptop and get work done while on the road. Since I’m female and would be traveling solo, do you have any thoughts on places that really aren’t safe? Tough question for me to answer, but there are a number of solo female travelers that have shared their perspective in the Facebook truck camping group. I would advise you to avoid boondock camping areas that are close to city limits. Places like Lake Mead outside of Vegas come to mind, as they attract a lot of homeless vagrant types camping out. Can you lock yourself in the back of your truck while sleeping? I use one of those snowboard locks (it’s like a releasable cable lock) that I wrap around the canopy latches and lock to my wooden bed frame. I am a big skier so I would be interested to see if I could insulate the bed and canopy in some way that would make it survivable on sub freezing nights, or if that is even possible. I always just did it like I was tent camping… Warm sleeping bag, mountaineering tricks like a hot water bottle, eating fatty things before bed, etc. But that would certainly get tiring over the long-term. I only did it for about a week at a time, give or take, in truly sub-freezing temps. I remember the olive oil turning opaque and the peanut butter turning rock solid. I’m trying to decide if I need the 4wd with its extra weight, maintenance, and expense. Thoughts? I’m wondering how often you’ve engaged yours when traveling in the Western US. 4WD was very infrequent. More often used in snowy mountains or really rough desert. There were only a few times where I really needed to engage it in order to access a free camping spot. I can remember one in particular near Zion, maybe another while road tripping in Arizona. 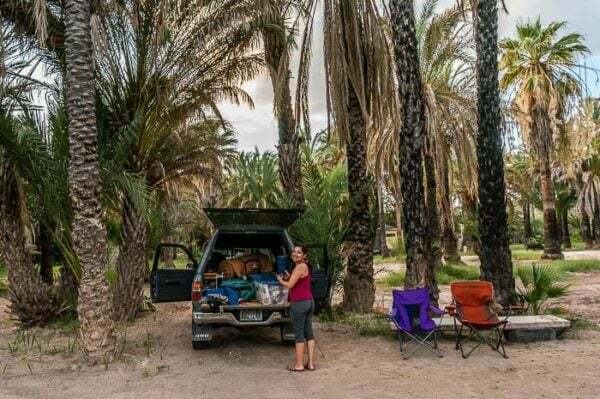 You could certainly travel most everywhere without 4wd and still find plenty of free camping, though you might get left out every once in a while. Even did all of Central America and only used it a few times. For my style of travel it’s like maybe once a month at most. I’m looking at buying a used truck. If I’m planning to use the truck as a periodic escape vehicle primarily, not as my daily driver, do you have any thoughts as to how many miles I can have on it and hope for relative reliability? If I were looking to buy a Toyota truck, I probably would want to keep it under 200k miles, if it’s in decent shape. That way you’ve still got plenty of life left in it for your travels. They are pretty reliable rigs and can keep going and going with some occasional big repairs. 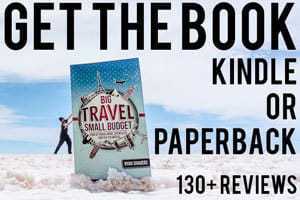 I’ve got 185k or so on mine right now and still planning to do plenty of travel (all of South America is next!). I have a question about your drape situation. I’m assuming you attached the Velcro to the clips yourself, correct? Did you use a different adhesive? I’m also curious if you have seen any wear on the topper carpet from pulling the Velcro on and off. I just bought a set of cheap chip clips at Wal-Mart, and in the fabric/sewing section you can get the sticky backed velcro. I just cut small pieces and use the adhesive it comes with. To be clear I do not pull the velcro on and off. I mount the clips with velcro where I want them and leave them there. Then you just clip the curtains in place. Take the curtains down before you drive so they don’t swing or weigh down on the headliner. When I do want to occasionally move or remove the velcro clips, I hold the headliner around the clip and gently peel it off. No I haven’t noticed any damage. But like I said, don’t drive with anything heavy velcroed to the ceiling like Led lights or curtains or whatever. Don’t mount things that have to be pulled off regularly. For instance, my led lights attach by magnet to a base plate, the base plate is velcroed to the ceiling and stays in place. Then I can just pop the light on and off with the magnet. The standard size magic shades fit perfectly along the two back side windows, they wedge right into a little groove and stay put, no need for anything else. The window at the canopy door, I have four velcro’ed chip clips on the lining above. I have two jumbo size magic shades, and I clip them in at the top, and then bump the bottom of them up against the closed tailgate. That works well. The four velcro’ed chip clips are along the long side windows as well, where I use thick black fabric. My question is related to the shower and bathroom. I’ve seen portable showers on REI, think I’d get one of those. Do you carry a portable toilet or the wild makes due? People do buy those portable showers, but my thought has always sorta been that usually the places with water are popular areas with other campers where I wouldn’t really want to be showering in public, and the most private areas (at least in the SW) are those without water where I wouldn’t want to waste a limited supply. That’s my experience. I just use wet wipes or whatever. I’ve met at least one guy who loved his portable shower (a black PVC tube attached to the roof rack on his canopy–so it heats in the sun). I don’t carry a portable toilet. They are quite large. In all my travels I have been able to make do with either the wilds or public bathrooms before heading to camp. I do carry a few mountaineering blue bags, in case of emergency, but have never used them. A pee bottle is a must have though. I did use that quite a bit while stealth camping. A two liter, soft-sided nalgene works well. Where do you get snail mail? Do you need a traditional address for some things? My snail mail goes to my mom’s house, but I don’t really need it for anything. It’s mostly junk mail that arrives, really. All my important notices come via email as well. I’d go with a friend or family member. Or you can do one of those services that receives your mail and scans and emails it to you, if you’ve got the budget. Do you insure your stuff or does car insurance cover theft? I have renters insurance which covers the theft of some items. But you need to be careful about the fine print related to electronics and such. Travelers insurance through World Nomads has some coverage too. It’s a good thing to have for peace of mind. In your opinion what would be a good amount of money to start off with? My idea is to start with like $3,000 and work my way through the states via under the table labor, but I don’t know from experience if that’ll work. $3,000 sounds like a good start. You might find it difficult to find temporary work like that as you move around. But I also don’t know from experience if that works or not. 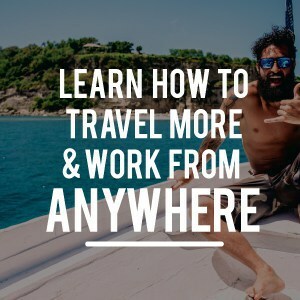 Most people tend to either be traveling on full savings or some sort of retirement like income, do seasonal work (ie six months on and six months off) or work via the internet. I always encourage readers to start a side hustle as soon as possible and try to work part time from the internet. Even just adding a few hundred dollars per month can really change the financial picture — see what I mean with the Side Hustle Calculator. I still think that this model from the 4HWW is one of the best to follow when considering freelancing and breaking into the uncredentialed job market, give it a read! I was concerned about the battery thing while working on photos on my laptop at night. Have you heard of company called Goal Zero? They have a battery that can be pre-charged by wall outlet and then can connect solar panels to recharge when you are away from electricity. What do you think of solar? Goal Zero has a great reputation. I’ve never used their products personally, but I know many who do. I too have looked at the big battery pack thing. It holds appeal. The first year I traveled, I actually just kept my laptop and things charged with an inverter and the starter battery of my truck (being sure to idle once every hour to ensure no risk of a dead battery). Honestly, the best thing I did though was install a second battery with an isolator. That way you can charge and use electricity to your heart’s content and never worry about a dead battery. That would cost you around $300-400 or so, unless you can do it yourself. My main question was how to attach the vertical side bins to the truck itself. You mentioned that the clamps were the only thing holding the side bins to the truck. If that’s true, I guess they aren’t very weight bearing, meaning you have to have gear underneath to support your weight if you are doing the raised bed – correct? Yep, those clamps are the only thing holding the side bins up. I’m not an engineer but they support my weight just fine. I imagine most of it gets passed down through the vertical sheets of plywood and into the truck bed, and there isn’t much strain placed on the actual clamps. In any case there has been no warping or anything of alarm related to the side bins or clamps. Using a 1/2″ thick piece of plywood for the movable platform though, that has the tendency to bow a little bit without support below. Not enough to cause alarm. That I partially mitigate by placing that little 2×2 brace underneath as I enter the back of the truck (where my weight is focused all at the entrance, rather than distributed over the length of the bed). This setup has been used on and off for a few years now. Not saying it will last forever, but it’s held up great, really, for all the wear and tear of two major road trips of the American west, and the big drive through Central America. Granted, I only use the elevated camp mode, one out of every 10 times, or less. But I’ve even slept with my girlfriend in the elevated mode, so it was able to bear the weight of two of us. Just wondering what your experience has been with the Teton Sports sleeping pad and if it soaks up moisture in rainy environments and humidity. I’ve put mattresses in the back of my truck before that soak up moisture like a sponge and they seem to always mold. I can honestly say that we never had any problems with it absorbing moisture, I would definitely not characterize it as a sponge. Though I can’t say that I ever really spilled water directly onto it, perhaps it would then get soggy, but sleeping in humid areas through Central America and never had a problem. I like the pad. It’s still the best pad that meets my criteria. It’s not the perfect pad, but so far as I know, that pad doesn’t exist. I wrote a more complete post on sleeping pads on my site, if you haven’t seen it. What major mechanical issues have you encountered with your truck? What kind of toolkit do you carry in anticipation of troubleshooting issues when you’re way out? The only major issue I’ve had since starting the road trip life, is the timing chain broke (a sort of common issue with the 22RE motor) which happened somewhere around 160,000 miles. That happened to me driving through Utah. Cost me $1,100 or so.  That’s been the only major failure, besides common things like getting a new clutch. As for the toolkit I carry, I have a basic set of stuff (screw drivers, pliers, wrenches, etc) as well as a ratchet set. I try to carry coolant and oil at all times. Spare tire, jack, the stuff to change it. That’s about it. I don’t carry self-rescue gear, spare parts, or any of that stuff. 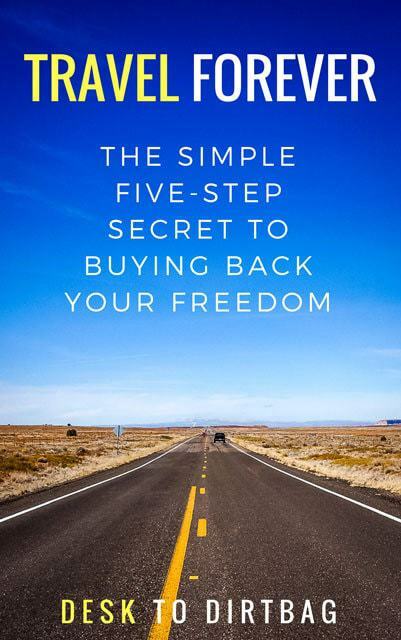 There are plenty of long-term road trippers or overlanders that carry tons of stuff. I’m not really a mechanical know how, so my maintenance consists of opening the hood at least once a week and visually checking everything. AAA premium is a nice peace of mind in the States. See more about the emergency gear and toolkit I carry with me in the truck camping essentials article. My question is about the piece of wood that you have on the tailgate (with the two holes cut out to hold fuel cells while cooking) – How did you attach the wood to the tailgate? I have a plastic bedliner, which also included the tailgate (screwed into place). I removed the screws and used the holes in the plastic liner to trace out the screw locations on the plywood. Then just drilled that out and replaced the screws (same diameter, but longer) to hold the plywood in place. I think there were like 8 screws. It’s a quick and easy thing, but definitely recommended! It’s awesome to have a flat surface to cook, sit down, organize gear, whatever. The question I have, is with lower temperatures/snow/rain, I have been closing the windows of my canopy more during night, causing a buildup of condensation that lines everything by morning. How would you deal with not getting wet due to external forces while at the same time not get wet due to internal canopy sources? Condensation is a tricky one. Is your canopy lined with carpeting? That helps a ton by itself… You might consider gluing in even a partial headliner to help with the problem. The other thing you can do is being able to crack open a window, even a little bit. I usually open the small window between the canopy and cab. Rain usually doesn’t get in, but you cover the little entryway so nothing gets in. I’d also just consider adding a tarp entryway to the back of your truck so you can crack the windows and get better circulation. I picked up a tarp from Wal-Mart and a few bungy cords for a great and flexible system. Your Questions About Truck Canopy Camping? I’d love to hear your truck canopy camping questions — send me an email or sound off in the comments, and I will get back to you! Did you enjoy this post on truck canopy camping? Please take a moment to share it on Facebook, Pinterest, or Twitter. I am thinking about buying a canopy for mainly camping but my truck bed is 5.5′ and I am 5.9′ Do you think it would be worth buying $3,000 canopy. Hey Sterling, I don’t really have the answer about fuel economy for a much higher cap. As for power, the truck did fine in every condition imaginable on the drive through all of Central and South America, including driving at 15,000 feet! Check out some of the extremes the truck went through here. My wife and I talking about the pickup truck camping thing, but we have a large dog. How easy is it to find places to stay that don’t mind the dog? 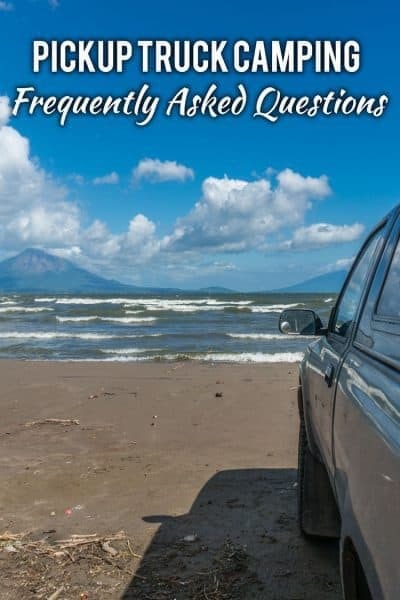 I haven’t traveled with a dog, so maybe another reader might be able to answer — or be sure to ask this question in the Pickup Truck Camping FB group.